This book illustrates the wide variety of applications of psychology to the criminal and civil justice system. Illustrates the wide variety of applications of psychology to the criminal and civil justice system. 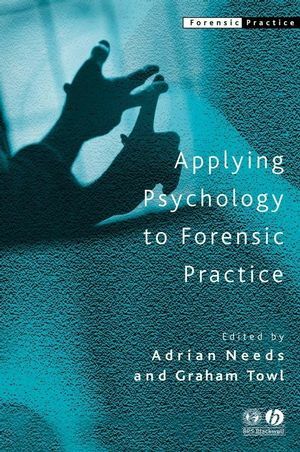 Gives examples of how forensic psychology can benefit not only from clinical and criminological approaches, but also from the insights of occupational, cognitive, developmental and social psychology. Many of the chapters introduce readers to areas which have not received extensive coverage elsewhere. Includes new directions in forensic practice. Chapters draw out the implications for professionals working in the field. Contributors include both academics and practitioners. Reflects both the scope and the potential of forensic psychology. Adrian Needs runs the MSc in Forensic Psychology at the University of Portsmouth. He worked in the Prison Service for many years and as an office holder in the BPS has played a leading role in the development of training in forensic psychology. Published work includes articles on social skills interventions, sexual and violent offending and prison officer training. Graham Towl is Head of Psychology for the Prison Service and the National Probation Service. His recent publications include Psychology in Prisons (Blackwell Publishing, 2003) and numerous journal articles on suicide and self-injury, risk assessment with offenders, ethics and public sector management. Section I: Working with Offenders; Analysis and Intervention. 1. The Offender’s Perspective on Crime: Methods and Principles in Data Collection: Claire Nee. 2. The Community and Family Context in Understanding Juvenile Crime: Mark Wilson. 3. Offence Paralleling Behaviour (OPB) as a Framework for Assessment and Interventions with Offenders: Lawrence Jones. 4. Risk Assessment: David Crighton. 5. The Management of Difficult Clients: Ruby Bell and Sue Evershed. 6. Intellectual Disabilities and Crime: Issues iIn Assessment, Intervention and Management: William R. Lindsay, Jacqueline Law and Fiona MacLeod. Section 2: Working with Criminal Justice Personnel. 7. Violent Police–Suspect Encounters: the Impact of Environmental Stressors on the Use of Lethal Force: Aldert Vrij and Jo Barton. 8. Enhancing Eyewitness Memory: Developments in Theory and Practice: Pam Newlands. 9. Occupational Stress and the Criminal Justice Practitioner: Jennifer Brown. 10. The Contribution of Job Simulation Assessment Centres to Organizational Development in HM Prison Service: Keith Baxter, Kirstin Davis, Eliot Franks and Sonia Kitchen. 11. Design and Evaluation of Training: David Boag. 12. Facilitating Multi-disciplinary Teams: Adrian Needs and Jo Capelin. 13. Applied Psychological Services in HM Prison Service and the National Probation Service: Graham Towl.